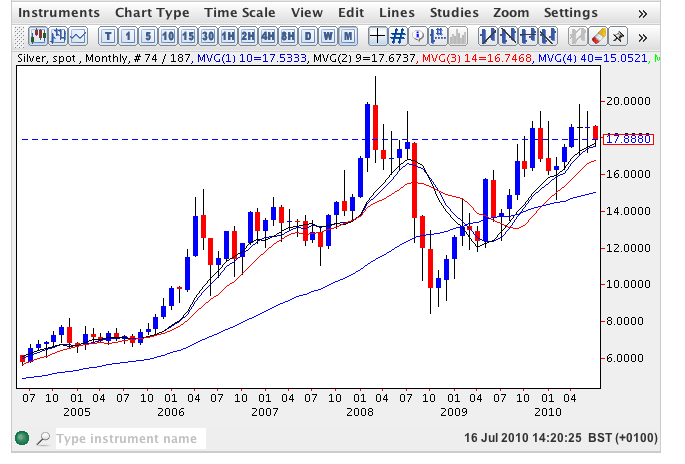 Spot silver prices on the monthly chart continue to remain waterlogged with both May and June closing with long leg doji candles indicative of market that is indecisive and lacking in direction. So far this month this sideways price action has been repeated once again with the silver market re-testing to the downside yet finding good support from the 9 month moving average. The two key price levels for spot silver are $19.935 and $21.340 and should we see a breach of the first then the second should be achievable in due course.